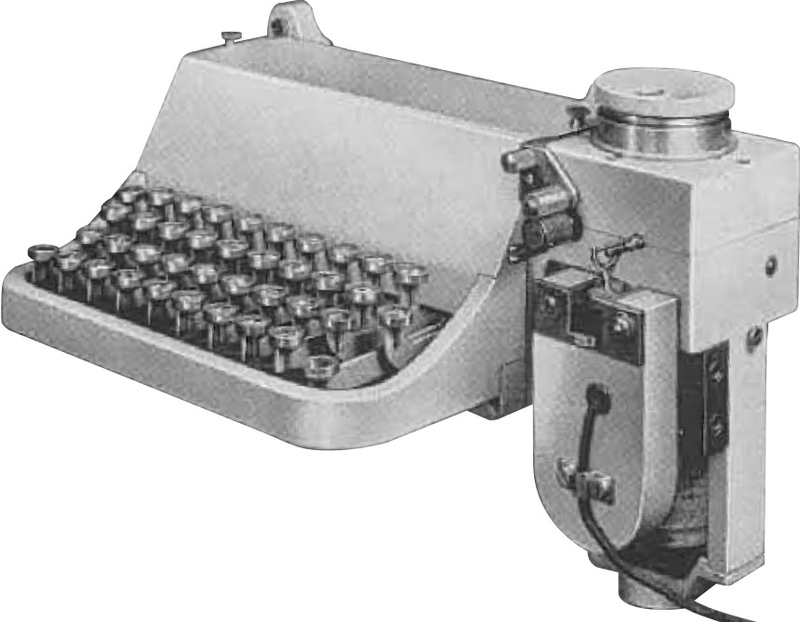 Rudolf Hell sold the rights to his "Hellschreiber" technology to the Siemens-Halske company in 1929. Siemens-Halske industrialized and manufactured the Hellschreiber machines. However, Rudolf Hell and the Hell company also designed and built some Hellschreiber printers and senders. They are described on this page. Hell Feldfernschreiber ("Feld-Hell") model TBs24b (a.k.a. moel S8K). 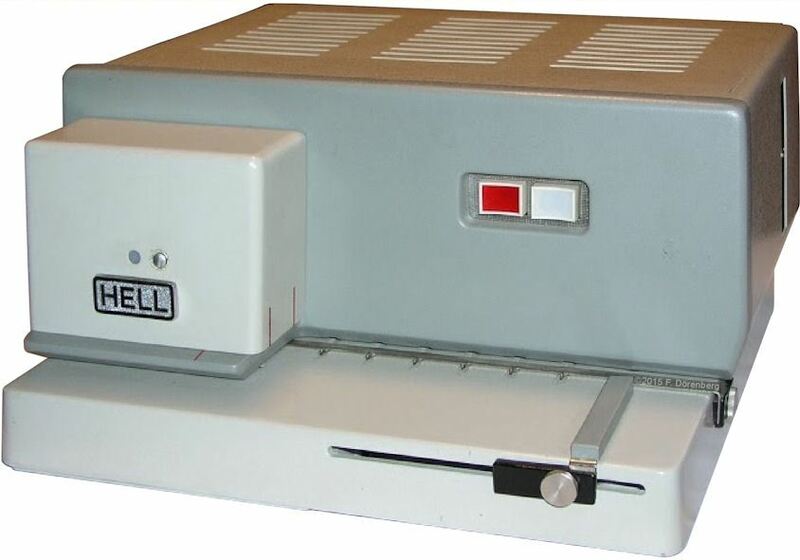 Note: the Siemens-Halske Feld-Hell machine is model TBs24a. Hell's involvement with the concepts and development of Siemens-Halske Hellschreiber models T.empf.40, model 44, and start-stop models T.empf.39, T.typ.72 & T.typ. 73 is unknown. Rudolf Hell's first Hellschreiber prototypes used electro-chemical printing, without a spinning helix. 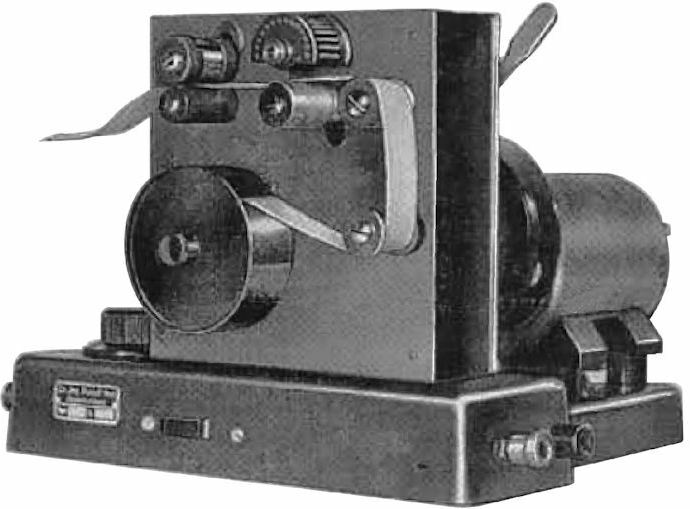 Electrochemical telegraphy printing on paper tape dates back to the early 1800s (von Sömmering, Germany), which was improved upon several decades later (e.g., Alexander Bain, ref. 1G). The paper tape was impregnated with yellowish potassium ferrocyanide (prussiate of potash, "gelbes Blutlaugensaltz"). Sometimes ammonium nitrate was added as a deliquescent (to keep the paper damp). The tape had to be moist, so as to be conductive to electrical current. Passing current through the salt solution caused it to change color, by decomposing it into a compound called Prussian Blue ("preußisch Blau", "Berlin Blau"). Heating the compound (or adding acid) causes toxic cyanide to be released. Prussian Blue dye was used since the early 1700s, including for dyeing the cloth used for the uniforms of the Prussian military - hence its name. It is also gave its characteristic color to "blueprints": copies of technical drawings, based on a photochemical process involving Prussian Blue, widely used in the decades preceding the modern photocopier. 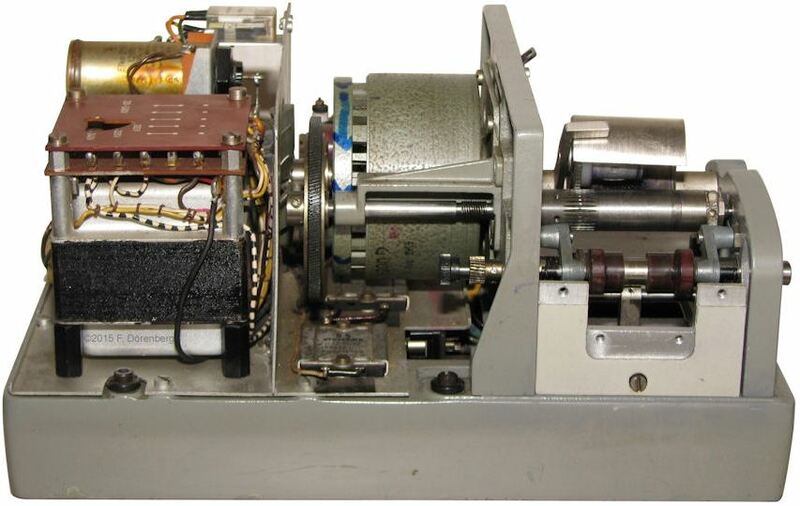 Instead of a spindle, the printer had 14 styluses, placed into a column across the paper tape, touching the tape. Current could be sequentially applied to each individual stylus ( = scan), the current circuit being closed via the moist paper tape and a metal roller underneath the tape. 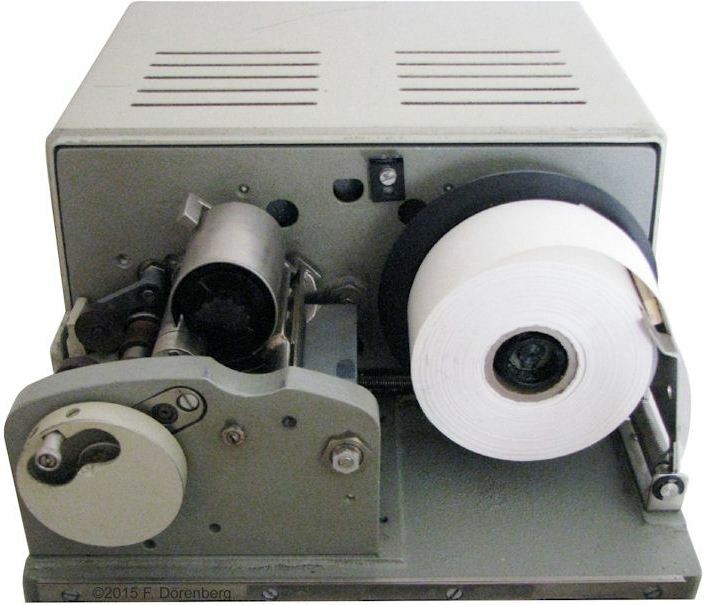 This form of printing proved impractical: the paper tape had to be kept moist, it had an unpleasant smell, the chemicals would cause the paper tape to fall apart, dried paper tape would shrink, and printed text faded (ref. 6). 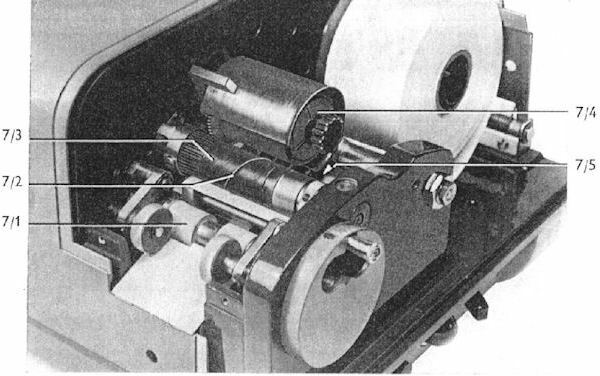 Note that electro-chemical tape printers where not new, see the "How it works" page. As stated above, this printing method did not use a printing helix, and was impractical. It was abandoned in 1931, in favor of the first generation Hell-printer that did have a printing helix. This spindle was used to transfer carbon particles from a carbon-covered tape onto the actual printing-paper tape. It was industrialized and manufactured by Siemens-Halske, and is described on the "Presse Hell" page. 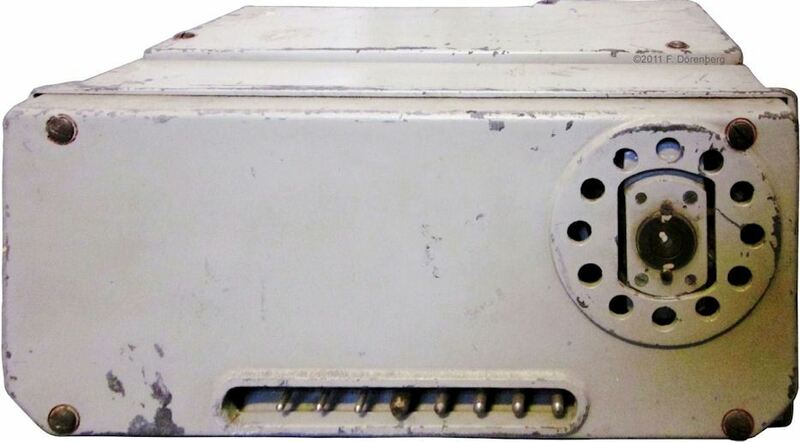 The Hell company built a series of Hellschreibers for the Kriegsmarine (the German navy, 1935-45). The type designator is "NS" followed by a one digit number. Shown below are the NS2 and NS3. I have no information about NS1, or if there ever was an NS4, etc. 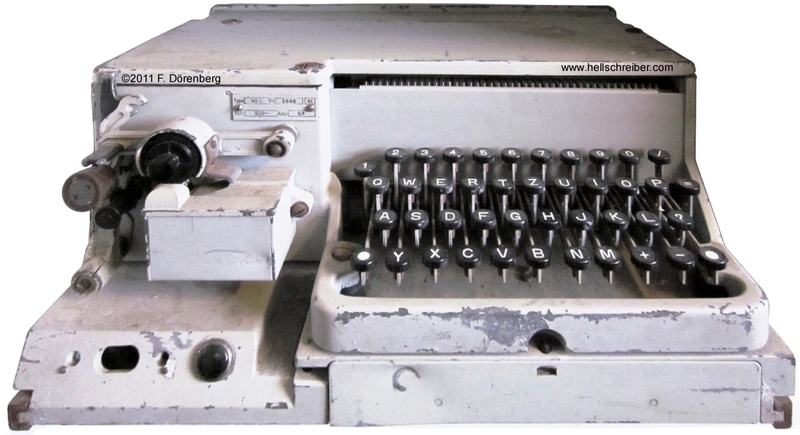 "NS" may stand for Nachrichtenschreiber, which literally means "news/message (tele)printer", but is also a generic term for teleprinter. The units are painted standard navy gray. The NS-keyboard differs slightly from that of the Hell Feldfernschreiber: it has an "=" sign instead of the latched pause-character. The Feld-Hell "space" key (bottom right) now has a large white dot on it. The "Morse" key (to the left of the A" and "Q" key on the Feld-Hell) has moved down to the left of the "Y" key, and the dot is now white instead of green. 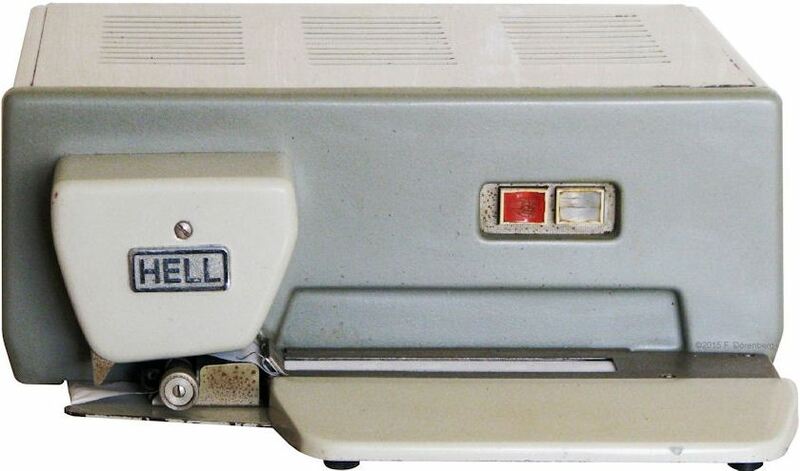 Like the Feld-Hell machines, it has a paper tape tray below the keyboard. The units operate on 220 volt AC power. This is the standard ship-board power for German navy ships and submarines (when not running on batteries). As the NS units used 220 volt AC, they did not need the generator part of the Feld-Hell's 12 volt DC dynamotor to generate the anode voltage for the vacuum tubes - if there are any tubes in the machines, which I do not know. The famous WW2 battleship "Bismarck" had four electric power plants: eight diesel generators, and six turbo-generators. In total almost 8 megawatt of DC and 220 volt AC power! This ship was enormous in many ways, including the price: the equivalent of some 35 submarines at the time! The photos below show no adjustment knob for motor speed adjustment. This implies a synchronous AC motor, and quasi-synchronization via the AC electrical power network. The telegraphy speed of these machines is unconfirmed, but most likely 2.5 characters/sec, like all other non-start-stop Hell-senders before the Hell-80. The photo above shows that the rear-connector has a large number of pins. I do not have a schematic of this model. Besides pins for the 220 volt AC power and ground/earth their should be pins for audio (tone-pulses) input and output, and possibly direct access to the character-drum for directly keying a CW transmitter. The U-Boat class "Großer Delphin" was a 2-man submarine. It is unclear if it ever entered into active Kriegsmarine service. It was supposedly (to be) equipped with a "Kreiselkompaß mit Hellschreiber" (ref. 2). I.e., a (possibly remote/"blind") gyro compass, somehow combined with a Hellschreiber printer. If you have any information or documentation on this model, please contact me! In 1947, Rudolf Hell re-established his war-torn company for telecommunications and electronic image reproduction equipment. However, now in Kiel (port city in the far north of Germany), rather than the original locations in the then Soviet-occupied part of Berlin. 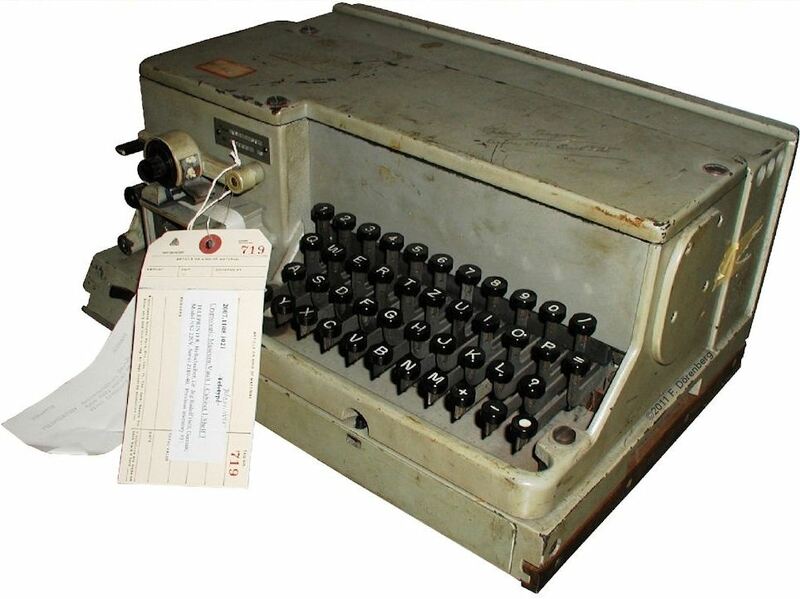 In the spring of 1948, the Hell company built a small batch of a new, compact printer-only model: the Hellschreiber-Empfänger 5, (HE 5). After the first batch was sold, the color of the HE 5 was changed, and the model name changed to HE 6. Ref. 3A. The list price of the HE 5 was 5500 Reichsmark. In June of 1948, West Germany went through a currency reform ("Währungsreform"): the transition from the Reichsmark (RM) and "Besatzungsmark" ["Occupation Mark"] banknotes that were issued by the occupying Allied military authorities, to the Deutsche Mark (DM). The general conversion rate was 10:1. However, it was 1:1 for company stocks, salaries, pensions, rents, and 100:6.5 for cash and savings. After the reform, the HE 5 cost 550 DM. The price was raised to 650 DM. Ref. 3A. These prices are equivalent to an estimated 1000 Euros and 1250 Euros respectively in 2015, based on general consumer price index inflation statistics (ref. 3B). 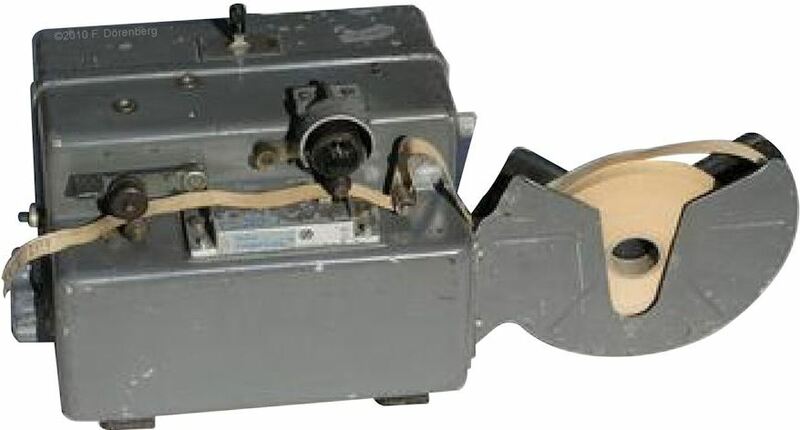 Around 1960, Hell developed an optical-scan paper-tape fax system. These machines were used by Air Traffic controllers (to exchange flight info strips), weather services at airports, police (to transmit fingerprint cards), restaurants, factories, labs, etc. Ref. 4A. It is called ZETFAX, short for "Zettelfax" ("Zettel" = a note, or slip of paper). On the sender side, text is handwritten onto paper tape. The paper tape is pulled through an optical column-scanner. Light from a small light bulb is passed through a special lens that casts a bar of light across the tape. The light bar that is reflected off the paper, is passed via simple optics through a narrow slit and a spinning Nipkow-disk ("Spiralblende"). The holes in the disk effectively "chop" the column-scan into light pulses. These (moving) pulses are are detected with a window-type photomultiplier tube of type 931A (ref. 4C).The analog brightness signal from the photo-tube is passed through a level-detector (threshold). The resulting binary DC-pulses are converted to tone-pulses and sent to the printer at the opposite station. The 800 volt anode voltage is generated with a 10 kHz oscillator and transformer-rectifier (switched power-supply). The equipment is fully transistorized. Ref. 4B, 4D, 4E. The Nipkow-disk has a series of small holes, arranged as a 1-turn spiral. It was conceived by Paul Julius Gottlieb Nipkow (1860-1949) on Christmas Eve of 1883, while a student at the Friedrich-Wilhelms University in Berlin. In the Anglo-Saxon world, "Nipkow" is ususally spelled "Nipkov". The scanning-disk has an additional hole at the circumference. With a light source and a photodiode, this creates a start-pulse (one per revolution of the disk), to synchronize the sender and the receiver/printer. On the printer side, this (dis-)engages a clutch on the printer spindle. The printer is basically a classical Hell spindle-printer. It has a spindle with a 1-turn thread. It uses the same type of paper tape as the the sender. 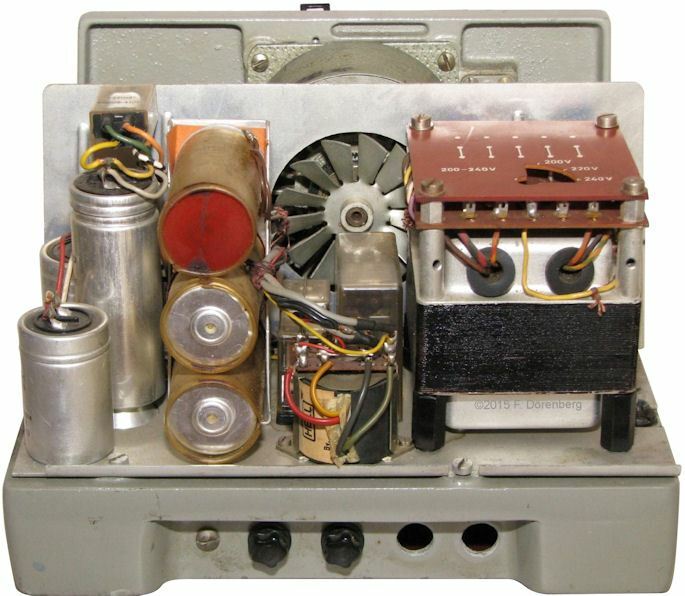 Both sender and printer unit have a synchronous AC-motor (brand: Papst Motoren GmbH, type "Außenläufer" (a.k.a. "squirel cage")). In "modern" countries, the power plants that feed the 50/60 Hz public power grid, are tightly synchronized. This minimizes speed differences between a sender and printers that are connected to such a national (or international) power grid. As with other Hellschreibers, transmission can be done via phone lines and radio. ZETFAX can be used in uni-cast as well as multi-cast configuration (1 sender to many printers). Ref. 4G. The ZETFAX machines were developed and built by the Hell company. However, at least in some parts of the world, the ZETFAX was marketed, sold, and supported by Siemens; e.g., in Singapore and Malaysia (see advertisement further below), and in Spain. 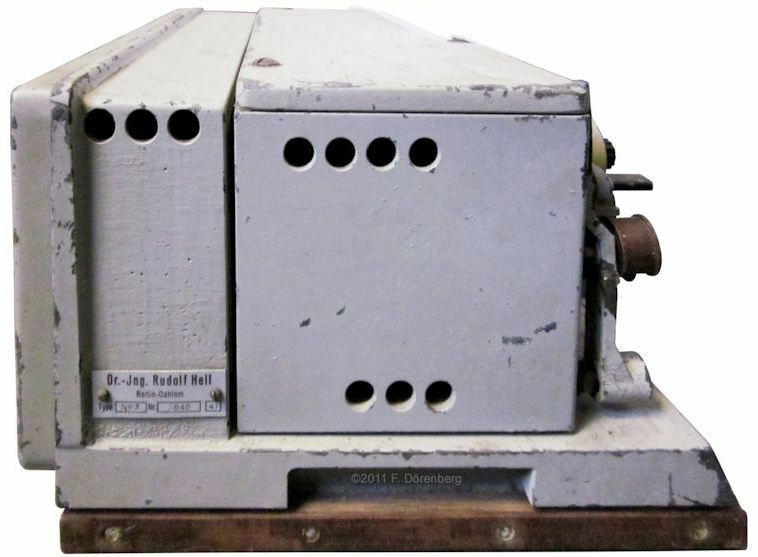 In 1968, the Spanish Air Ministry ordered 25 Hell ZETFAX HT206 senders and 50 HT207 printers - plus enough spare parts and supplies for two years - from Siemens Industria Eléctrica S.A (ref. 4H). The equipment was used by the national meteorological service. 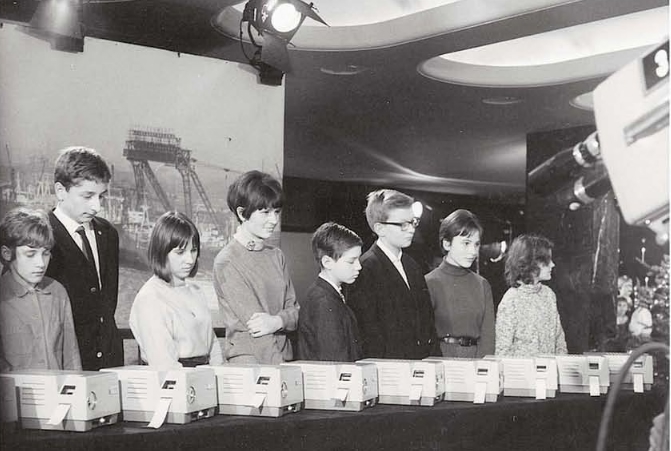 Total cost was 5 million pesetas in 1968. This is equivalent to almost 347 thousand Euros (465 thousand US dollars) at the end of 2011, based on historical exchange rate data (ref. 4J) and historical US inflation data (ref. 4K). ZETFAX was used at German airports at least through 1980, for reporting runway visibilty conditions (ref. 4N). Listed below are Hell patents related to the optical scanning and transmission of text printed on paper tape. Fig. 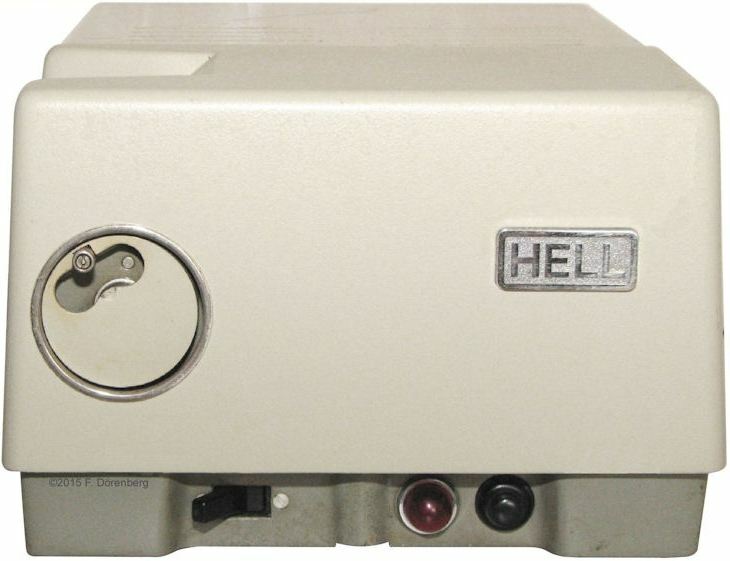 15: Equipment label on the Hell HT206a ZETFAX-sender shown below. Ref. 1A: "Die Entwicklung des Hell-Schreibers" by the inventor himself: Rudolf Hell; pp. 2-11 in "Gerätentwicklungen aus den Jahren 1929-1939", in "Hell - Technische Mitteilungen der Firma Dr.-Ing. Rudolf Hell", Nr. 1, Mai 1940 [in German]. Ref. 1B: "Stand der Siemens-Hell-Fernschreibtechnik", R. Zimmerman, Siemens & Halske A.G., Siemens Fernmelde Technik, SH 7997. 0,5. 1043. TT1. M/1401 (1940? ), courtesy Siemens Corporate Archives, München. Ref. 1C: "Der Siemens-Hell-Schreiber", Alexander B. Damjanovic, in "Zeitschrift für Fernmeldetechnik, Werk- und Gerätebau", Siemens & Halske A.G., Wernerwerk, Jg. 17, Nr. 12, 1936, 7 pp., SH 6554, 1. 37. 0,5 T.
Ref. 1F: §2 of "Anwendung von Faksimile-Hellschreibern für den Boden-Bord-Verkehr", Rudolf Hell, pp. 67-75 in "Flugsicherungs-Verfahren und -Technik: Grundsätzliches über die Technik für Flugsicherung und Betrachtung der wichtigsten technischen Hilfsmittel außer Radar", Teil IIIB in "Flugnavigation und Flugsicherung", Band 7 of "Bücherei der Funkortung", proceedings of the "Internationale Jahrestagung des Ausschuß für Funkortung", Berlin, Verkehrs- und Wirtschafts-Verlag, 1958, 107 pp. Ref. 1G: "Improvement in Electro-chemical telegraphs", Robert Smith, Alexander Bain, United States Patent no. 6837, 30 October 1849, 5 pp. Ref. 2: p. 709 in "Die deutschen Kriegsschiffe 1815-1945, Band 2", Erich Gröner, J. F. Lehmann Publ., 1966, 870 pp. Ref. 3B: "Inflation rate calculator, consumer price index (cpi) and price rise"
Ref. 4A: "ZETFAX, aus der Praxis, für die Praxis" [Hell Co. optical-scan + Hellschreiber tape printer], Rudolf Hell GmbH, 1968, 19 pp., ZA-2-6807(592). Ref. 4B: "ZETFAX - Faksimile Geräte", Hell Co. brochure Z-4-6611 (502), 6 pp. Ref. 4C: "913A, 913B photomultiplier", product brochure of Burle Electron Tubes, 6 pp. Ref. 4G: "Vermittlungs-Einrichtungen ZETFAX" [telephone exchange configurations], Hell Co. brochure ZV-1-6704 (534), 6 pp. Ref. 4K: "Cumulative US inflation for the period 1968 - November 2011"
Ref. 4M: p. 21 in "The Straits Times", 9 November 1965, Advertisements Column 2. Ref. 4N: p. 23 in "Instruments and Observing Methods, Report no. 6, Aerodrome Meteorological Measurements", M. Etienne, World Meteorological Organization, February 1981, 59 pp. Ref. 4P: "Das Hell-Jahrhundert" [The Hell Century], Lothar Deckert, 2006, Schmidt & Klaunig (publ. & printing), ISBN 9783-8831-2367-7, 182 pp. [24 MB] Source: Verein der Freunde und Förderer Technische Sammlung Dr.-Ing. Rudolf Hell in Kiel e.V; accessed 6 March 2019.